Long layered hair is one of the most the requested salon staple haircuts of all time. Layers allow long haired beauties to add dimension, texture and personality to their hairstyle. 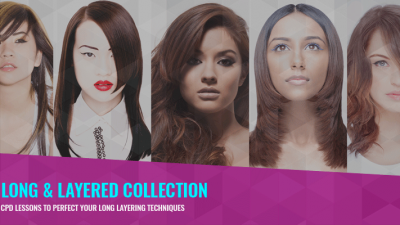 Long layers suit most hair textures, lifestyles and generations. At MHDPro we’ve pulled together the ultimate guide for choosing the correct long layered technique for the different hair characteristics of your long haired clientele. Layering is a cutting technique that removes weight from the internal lengths of the hair. 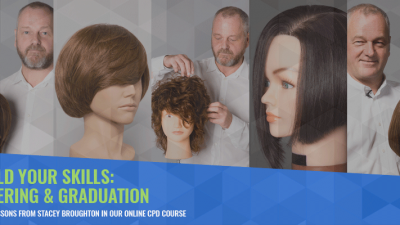 Layers do not add volume, however; as they remove weight from inside the shape they do make the hair easier to hold the volume and shape added during styling and dressing. Long layers can be cut at 90°, however they are most often cut between 135° and 180° of the head shape. On normal to thick hair texture our long layered variation technique is an ideal choice for enhancing movement. This technique, based on round layering, enhances hair texture and softness. The round layering technique releases bulk and weight internally which gives the illusion of the hair looking longer. To maximise texture, softness and length begin the technique in the front, over the cheek bones, incorporating over-direction and elevation. A variation of long layers starts the front, over the cheek bones. The key to this technique is creating a soft outline with no harshness. This is developed through the correct placement of finger angles and over-direction and elevation. The key to a long layer variation is the correct placement of finger angles, over-direction and elevation. A long layer variation is an ideal choice for creating versatility on normal to thick texture hair when styling and dressing. Learn this full technique with Aveda Artistic Director Bastian Casaretto in Lesson 1 of the Long and Layered Collection on MHDPro.com. A classic long graduation haircut is the ideal choice for clients with straight hair texture. Straight hair can be extremely unforgiving and the incorrect layering technique can give the illusion of the layers looking obvious and stacked. A classic long graduation ensures you maintain a strong outline to support soft movable internal long layers. A classic long graduation is the ideal technique for adding long layers to straight hair texture. This technique begins by placing a square outline below the shoulders. This clean perimeter becomes the basis to support the long graduated layers. Always begin your long graduation with a strong outline to support the soft internal layers. A long graduation is classically cut at 135°. The sections from the crown to the front hairline are cut at 180°. When cutting a long graduation on straight hair, it is important that all the hair is not elevated to 180°. 180° is an extreme angle for a long shape and can cause the shorter layers to push into the length and lay very flat. The 135° angle will encourage movement, volume and softness on straight hair. Learn this full technique with world class educator Graham Oglesby in Lesson 2 of the Long and Layered Collection on MHDPro.com. Adding long layers to fine hair can be a mine field if the wrong technique is chosen. The hair can easily become over layered, causing the outline to become weak and the layers unmanageable when styling and dressing. Our commercial long layered shape uses internal graduated layering and over-direction to protect the outline and internal layers. A commercial long layered shape uses internal graduated layering and over-direction to protect fine hair. The key to this technique is to use a pivoting motion and elevation to extend the length and keep weight on the outside of the shape. On fine hair it is important to remember that reducing the length and making the outline stronger can give the appearance of longer hair. Over-directing the front sections behind the ears will create more weight towards the front of the shape, making fine layered hair appear fuller. 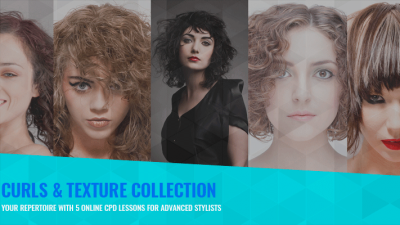 Learn this full technique with international educator Stacey Broughton in Lesson 3 of the Long and Layered Collection on MHDPro.com. A classic long uniform layering technique is often the best choice for thick wavy hair texture. This technique looks fantastic worn wavy or smooth and the correct distribution of internal and external weight provides a symmetrical hairstyle that frames the face beautifully. A classic long uniform layer is cut at 90°. All the hair is layered to the same equal length throughout following the shape of the head. A long uniform layer has all the hair cut to the same equal lengths throughout. The technique incorporates pivoted sections from the crown to the nape using curved uniform layered sections. Placing long uniform layers near the nape of the neck. A long uniform layer allows you to round out the front corners which can help the hair move away from the face. This super salon friendly technique is a perfect addition to your repertoire of long layered shapes. Learn the full technique with Stacey Broughton in lesson 4 of the Long and Layered Collection on MHDPro.com. Combining your layering techniques is the ideal way to enhance loose movement and texture in long hair. This uber commercial technique incorporates increased layering to maintain maximum length through the perimeter line whilst reducing weight through the mid sections. Started in the centre back, an increased layer is created by elevating the hair to 90° and then placing your fingers parallel to the floor. Place a square line from shorter to longer. An increased layer is started in the centre back. As you progress towards the front hairline the over-direction increases. The increase layering technique creates a loose, commercial layered look that facilitates movement and texture. It can be further enhanced by a soft sweeping fringe. Learn this full technique in with Tracey Hughes in lesson 5 of the Long and Layered Collection on MHDPro.com.